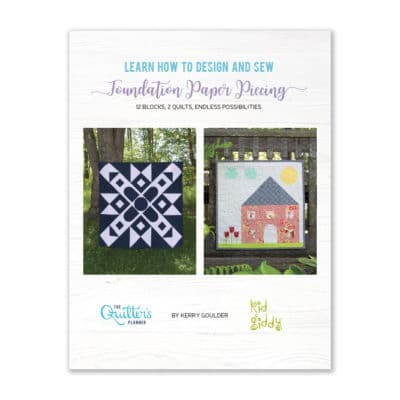 Welcome back for the 7th month of the 2018 Quilter’s Planner Block of the Month Sampler Sew Along! We can’t believe that we’re already halfway through the year. 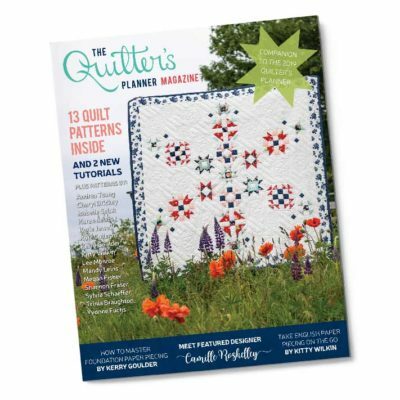 This month, we are working on Block 7 (page 34-35) in the Quilter’s Planner Magazine). Block 7 combines intersecting flying geese within a square in a square block. the instructions in the magazine explain how you would piece this block traditionally. 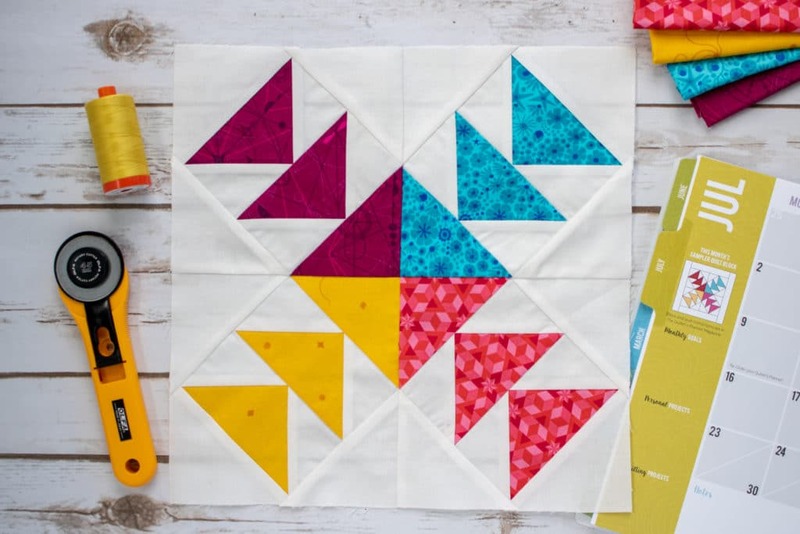 In this blog post we will give you tips and hints for the instructions, and we also are offering you a Foundation Paper Piecing template (see further below) so that you can paper piece the block instead, if you choose. For our Block 7, we used the following feature fabrics by Alison Glass for Andover: Reef in Mermaid from Diving Board, Starfish in Coral from Diving Board, Compass in Sangria from Sun Print 2018, and Diatom in Canary from Sun Print 2018. 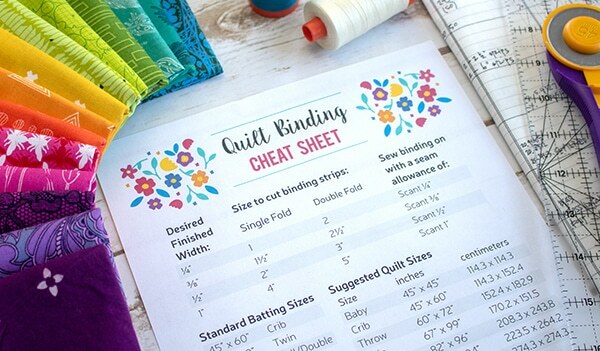 You will need to print 4 pages of the paper piecing template, and make sure your printer is set to 100% with no scaling. There is a 1 inch square on the page. After you print the page, measure it with a ruler to make sure your printer was accurate. (1) 3⅞” squares of each Fabric A-D, I cut mine at 4⅛”. (6) 3⅞” x 3⅞” squares of background fabric, I cut mine at 4⅛”. 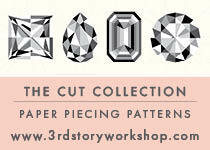 As in Block 5, they may look a bit strange when you are sewing, but you will have more room to trim them down to size. Before you cut the 3 ⅞” square of Fabrics A-D that will become the center of the block, you may want to pay close attention to any directionality of the print on your fabric. It will not be the same as the flying geese units. 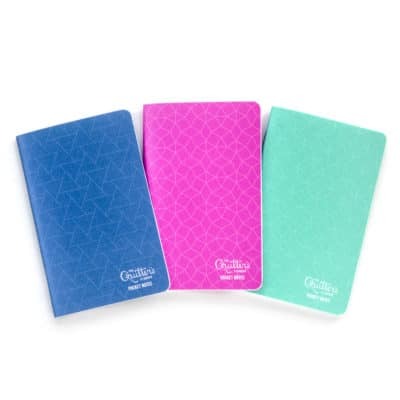 If you want them to match, you may wish to cut the square on point. When squaring your block make sure the points of your geese are ¼” away from the edge of the block before you trim so your points of the triangles are not cut off. If you’ve chosen to follow the Modern Bliss layout, there is 1 version of Block 7 in the quilt pictured on the cover of the magazine (the rightmost block in row 2). Also, don’t forget that the Modern Bliss layout uses blocks set on point (rotated 45 degrees), so that may be something to consider when selecting fabrics.